Do we confuse managers by the way we express Org Structures? 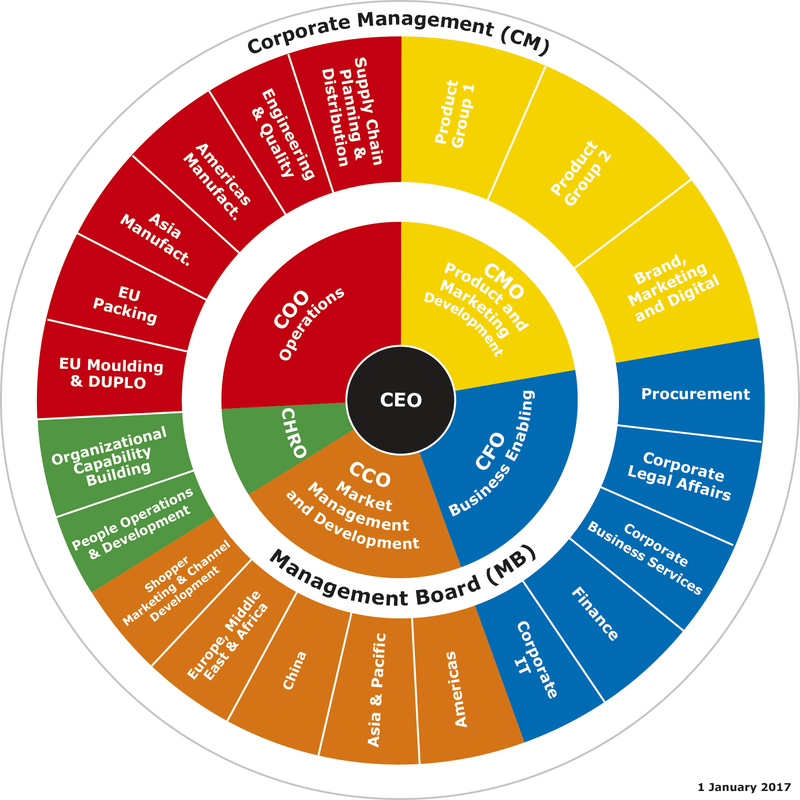 I was recently reading Lego’s annual report and came across their Organisational Structure (below). There is always a question as to the true day-to-day usage of such a significant shareholder document. However, it made me question Organisational Structures in general and how little diversity there is. The reality is that most Food Manufacturers operate with a traditional hierarchy. 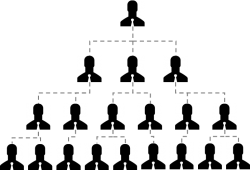 A hierarchy on a piece of paper may seem inconsequential, and of course corporate culture can indeed override the short falls of a traditional hierarchy. However, largely speaking, the paper display is reflected in day-to-day working relationships and business performance. Shows clear lines of communication and accountability. Can be seen to encourage silo mentality where cross level communication is not encouraged and the direct manager is overwhelmingly the important focus point for an employee. Collaboration is not encouraged as employees are not given autonomy to pick up a project or to innovate and build a team to support. A traditional hierarchy is useful where creative thinking is not required and clear communication is necessary. A flatter structure is positive for a reduction in bureaucracy and reports as communication is encouraged across all levels. This allows those further down the hierarchy to work with their colleagues and collaborate to solve problems. This works to engage and empower employees which can be motivating for those who can operate productively with a level of freedom. Total autonomy to self-appoint and deliver. Individuals are responsible for deciding what projects they want to work on and for assembling a team to deliver. It allows them to pursue their interests or where their skill set is most required. Ensures all are motivated as they have chosen what they want to work on. This structure is potentially impractical for a large organisation, but for a small company where creativity is important, this could be optimal. A hybrid of a traditional model and spin off teams who work on specific projects. in terms of the specific project this could be self-managed or set as a directive from senior management. This aspires to harbour innovation or improvement as well as deliver a steady repeatable output day-to-day. There are other possibilities outside of the ones we touched on here, and it’s important to select the most appropriate based on several factors. The market requirements, the realistic capability of people, the span of control, and how best to support the aspirational company culture are some of the most important. When arriving at a new structure, it is important to start a consultation throughout the company to listen to where people see issues. This not only engages colleagues but also provides important insight into how to get it right. Whatever the appropriate change a company arrives at, starting the conversations internally and reviewing the importance is certainly a necessary and indeed positive start. I recently received my regular invite to the University of Stirling, my Alma mater and where I act as a Business Mentor on the MBA program. It’s a role I find very rewarding. It allows me the opportunity to engage with my former lecturers and new students, particularly those from overseas. My role as a mentor isn’t formalised. I hear little, if anything, from the students after the event activities, although I am clearly on a database of contacts judging by the number of questionnaires I receive from the students on a cyclical basis as they prepare for their dissertations. Given I consider myself well mentored and having acted as a mentor throughout my career, I decided to do a little research on the subject. There is a model developed by Kathy E. Kram (1985) in which she identified the four stages of mentoring over time; Initiation, Cultivation, Separation, and Redefinition. Prior to considering these four stages, we must first assess the functional role of a mentor, and the types of mentors. Mentoring requires a personal commitment from both parties. The roles vary depending upon the type of relationship, the focus, and the structure. Mentoring could mean becoming a role model, acting as a supporter, a developer, or an advocate, or it could simply mean being a friend. At the heart of any mentoring activity, there must be a degree of trust and a developed relationship beyond that which you may have with a coach or a line manager. Mentoring relationships can occur formally or informally. Most mentoring occurs through informal relationships between a younger individual and an older one. Understanding the value of different types of mentoring will not only help you identify both quality mentoring opportunities, but also the type of mentoring you are receiving. Schemes which match mentors with a trainee and are invariably workplace led. They involve a structured program. Formats vary by program but they involve an end goal. Your line manager may have a role to play such as this, acting as an advisor, but this may conflict with their primary role of being a line manager. It takes the form of a formal contract between mentor and trainee. This is usually initiated by the mentor. One person, normally the one offering, reaches out to another. This type of mentoring is usually between people with some common ground. I would consider some of my closest friends and family as my natural mentors. This involves individuals at the same level providing skills training. It draws on the strength within an established team providing support, empathy, and advice. This is something that, as consultants, we have in our arsenal to form part of our service offering. It is designed for a specific purpose or skill set, and is generally short-term and task oriented. 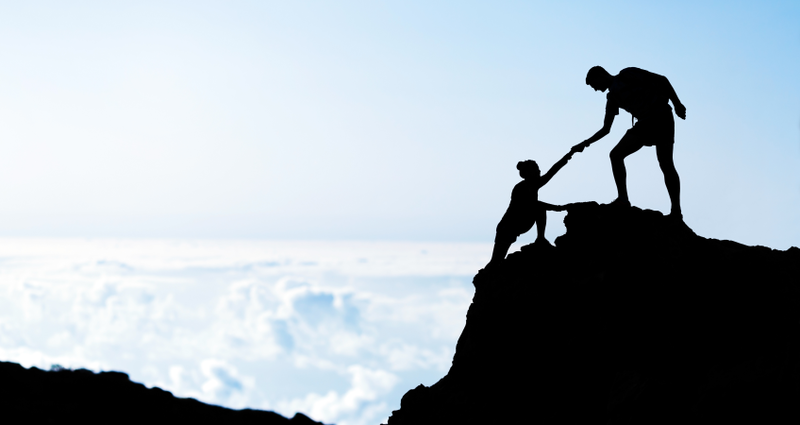 The role of a mentor is not one that a direct supervisor may be comfortable with. Given they fulfil multiple roles, which may include a disciplinary one, mentoring may not suit them due to a possibility of conflict of interest. This begins with an interaction with a chosen mentor and it may develop into a mentoring relationship. Another angle on this would be those fresh skill sets a younger colleague brings. Even the oldest and wisest mentors are never too old to learn. Look at yourself and identify your mentors across the broad spectrum of roles. Put some structure into the mentoring partnership if there isn’t one in place. If nothing else, simply let them know you consider them a mentor and make a point of regularly catching up and discussing how things are going, drawing on their experience, advice and skill sets. More importantly, try and identify those who you can make a mentoring offer to. It is a rewarding and fulfilling activity from which both parties can gain. Among those I consider my mentors are my partner, my long-term friend and now Business Unit Manager, my former military colleagues and my father. Those I have mentored, to list a few, are my grown-up children, a few select junior colleagues and some of my previous clients, who I have continued to keep in touch with, acting as a mentor but also drawing upon their specialist skill sets. You never know when a further business opportunity may arise! That 2016 was a year of significance is a hard one to dispute. Generalisations always break down when it comes to detail, but the tumultuous events in the UK through the EU membership Referendum, followed by Donald Trump’s more than remarkable election as President of the US rank as seismic political adjustments to my mind. What caused the ‘knee in the nuts’ for the prevailing political classes is subject to a lot of analysis, debate and no small amount of argument. It is clear that an established political order on both sides of the pond has become detached over a considerable period. An increasing proportion of a largely quiet electoral majority, not minority, were now being heard. It was quite telling when Iain Duncan Smith spoke of reports to him on the evening of the 23rd June that folks were queuing in the housing estates of England to vote after work. The political change is likely to be seismic for the politico-economy. None of us can know quite how President Trump is going to execute his economic and trade policy. Key issues revolve around deregulation, potentially lower taxes, rising infrastructure spend and, perhaps crucially, trading policy with China. If tariffs are, as promised to the US electorate, applied to Chinese goods, how will Beijing respond? Additionally, how will US business behave? We need only look to Ford’s move from Mexico to Michigan already. What will this mean, in time, for global economic growth? Closer to home there will be the near term calling of Article 50 by Theresa May. The outcome of this process is likely to be particularly significant for the whole of the EU, albeit probably with a slower burn than Mr. Trumps’ activities. One must hope that common sense will prevail, noting the considerable deficit that the UK has from a trading perspective with the EU. However, common sense and politics are not always aligned. Michael Gove can probably give a lecture on this after his post-Referendum shenanigans. No doubt Messrs. Cameron and Johnson could too. More to the point, there is a lot happening politically in the EU in 2017 that may mean conventional wisdom on trade negotiations today may not be convention tomorrow. I make this assertion noting 2017 elections in The Netherlands, France and Germany respectively. Quite how this will pan out remains to be seen, but those who thought that Mr. Trump would not be the Republican nominee at the start of 2016, never mind President, may like to think again. Indeed, following the EU polls, the UK may not be isolated in seeking to leave the EU at the end of the year as at the start. As such, unless the EU/Commission dramatically responds (that is, changes ho hum), the British may not be the last to destabilise the apple cart of the prevailing EU norm. Accordingly, there appears to be a lot of twists and turns to come in the political world, making business planning more difficult, particularly for firms trading across borders. Besides those at play in the USA, China, the EU and the UK, there are also copious dynamics to consider from Cuba to Russia, and Iran to Venezuela. These political machinations are outside the control of most business leaders. However, what the last year has perhaps brought home is the importance of understanding, insight and intelligence, plus the need to focus on what we can control. Such a statement is hardly a revelation, however it is clear that the political, legal, media, financial and libertarian elites of the Western world have not had the information to hand to be informed, or they chose not to look and listen. Accordingly, a new order that fundamentally challenges some norms and fiefdoms is now in play. Do I understand my customers? Am I listening to my customers? Do I have the mechanisms to listen and learn? Am I close enough to the drivers and forces of my market? Easy questions to pose, more difficult at times to answer, but important ones to be getting right for ongoing and long term business success. Whilst we have limited or no control over the direction of an electorate, or the politicians they vote in and out, we can learn lessons from what their collective opinions and challenges pose for our businesses and how we set ourselves up, operate and execute. There has never been a better time to know your customer. 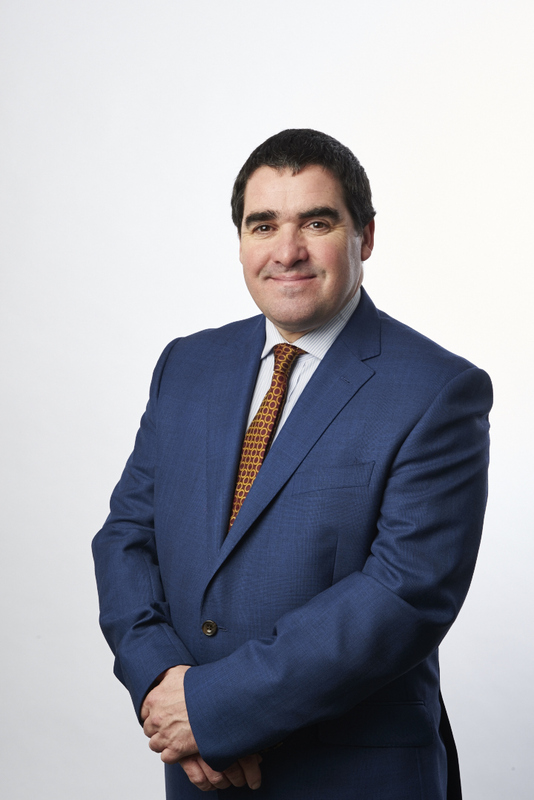 As a global provider of expertise and experience in the delivery of business transformation to the FMCG sector, we are pleased to announce that one of the UK’s top Consumer Analysts Clive Black has joined our Advisory Board. Operating globally from our offices in Nottingham, UK and Sydney, Australia, we have made the appointment with the aim of reinforcing our understanding of the rapidly moving FMCG marketplace. 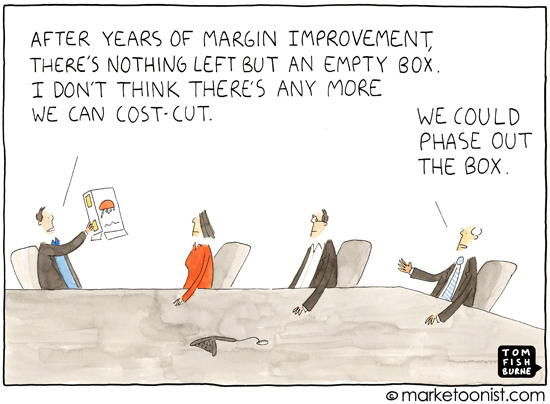 Nothing spurns morale, innovation and engagement faster than cost cutting. Short-term project based programs are adopted by many organisations in response to events that change the competitive landscape. In these cases, cost cutting is seen as necessary to stay competitive in the market. But for those of us who have been through tough cost cutting programs, we must ask ourselves if we see the long-term benefits? And if we are being realistic with our targets? A study of more than 700 executives conducted by Bain & Co highlighted the gap between an organisation’s cost reduction targets and operational reality. With over 40% of the group not expecting to hit their annual cost targets and a staggering 80% not believing the savings they had made could be sustained long term, it’s obvious that something needs to change. Leaders should adopt an alternative approach to their cost reduction programs. The program should underpin the organisational strategy to increase competitive advantage, rather than chasing savings to satisfy budget requirements. Instead of cutting costs across the board, organisations should look for areas to divest poorly utilised resources and reallocate those resources to activities in their value chain that maximise their competitive advantage. A shift from ‘Cost Reduction’ to ‘Cost Transformation’. Jobs famously stated ‘Deciding what not to do is as important as deciding what to do’ and whilst that is true for products, it is also true for companies. Effective management of organisational cost transformation results in dramatically increased productivity and profitability. It encourages staff to become active in contributing to the organisational strategy, allowing them to work as a team to decide where best to allocate a company’s resource. This adds value far beyond what they believed possible in their roles. The result is increased engagement and ownership, fortifying the sustainability of changes made. A great tool to assist managers with cost transformation is the GE-McKinsey 9-box matrix. This matrix was developed by McKinsey&Co in the seventies to help GE prioritise resources in numerous business units. Since then, the matrix has been widely used to help organisations assess the relative merits of various opportunities. When managed correctly, cost transformation can be game changing. In 2013, Heinz began their cost transformation by restructuring management. They cut 7,000 jobs that were not adding value, banned all corporate jets and implemented ‘zero-cost’ budgeting for managers. This strongly incentivised managers to drive profitability, and by paying more attention to how their resources were utilised, they could identify critical business functions that were over-resourced or under-resourced. In 2013, Heinz recorded a profit of $18 million and in 2014, Heinz posted a year end profit of a whopping $657 million. Whilst it is always great to have a breakthrough, the true value in cost transformation comes in the form of long term benefits. These are associated with a sustained program embedded in an organisation’s day-to-day activities. A continuous cost transformation culture allows an organisation to reallocate resources to fund future innovation in critical links in the organisation’s value chain, driving bottom line growth. To achieve a continuous cost transformation culture and unlock the full potential of an organisation’s competitive advantage, leaders must be prepared to invest resources initially to upskill and align their team in this unified goal. The bottom line is, if the activities in your value chain that add the most value to your customers are not receiving the majority of your organisation’s resources, you may be getting it wrong.